I look at Marvelous In My Monday as super positive and Trade Em Up Tuesday as more honest about the good and bad. I certainly did not feel super positive about my Halloween weekend (not due to lack of fun though, that’s for sure) so I decided to wait and participate in Trade Em Up instead. I’m just still really struggling with being okay with the changes in my lifestyle that have happened since I moved to Boston. This was a big weekend for me and I’ve been feeling pretty crappy about it, but also thankful for the fun I had with family and friends. Such a last minute costume that I was building my laser cat glasses on the way to the party. 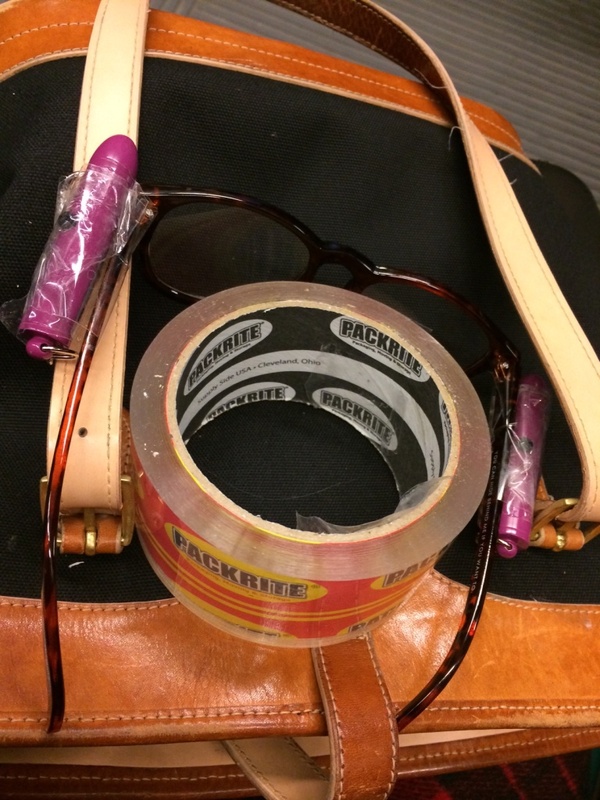 Note: crafting on the T makes you look like a crazy person. I would trade…waking up Friday morning with a hangover. Oof. Not enough sleep + a party that did NOT have water (frustrating) + a party that DID have an open bar + a cigar = dehydration and a very upset stomach. Yes, a cigar. 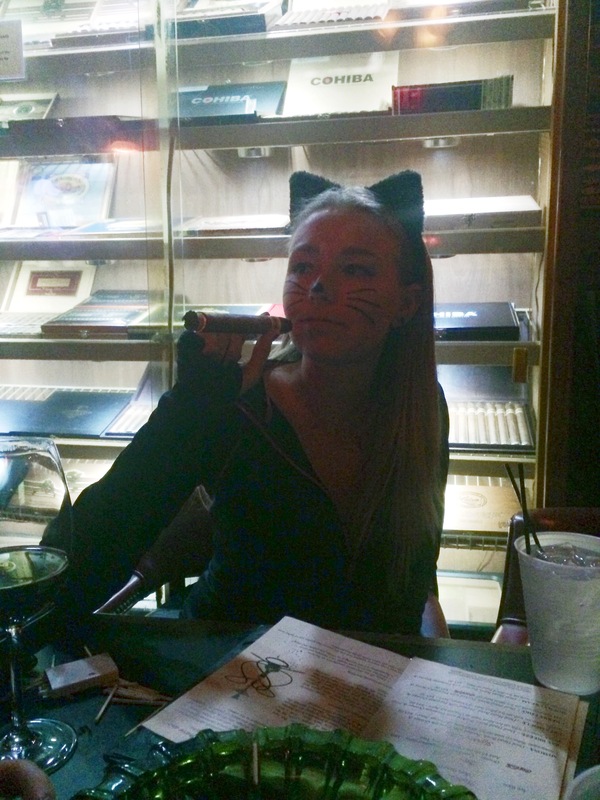 When you get the chance to go to an authentic cigar bar in the North End, while wearing a cat costume no less, you take it. Even if it’s WAY past your bedtime. I would not trade…walking to my physical therapy appointment. The fact that I walked two miles to the appointment on Friday made me feel better about not working out that day, plus the MANY slices of pizza I’d eaten at the party the night before. But calories burned while walking (sad but true that this was top of mind) were not the only reason the walk made me feel better. It just felt great to feel the crisp, but not too cold, air surrounding me. It felt good to watch the T go by, jam-packed, and know that I wasn’t stuck on there. I could roam and listen to music and take deep breaths. 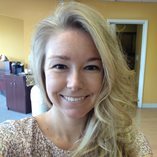 By the time I got to the appointment, I already felt less sick to my stomach. I would trade…having a difficult time feeding my body the foods it craved. But I still felt pretty meh, and tried throughout the day to eat my usual fruits and vegetables. Yeah…no. Finally around mid-afternoon I caved to the crave and had a bagel that a co-worker had brought in (with pumpkin cream cheese, for Halloween). I just took it as fate that the day I had a hangover, free bagels were sitting there at work. I can’t remember the last time I’d had a bagel and it was SO GOOD. 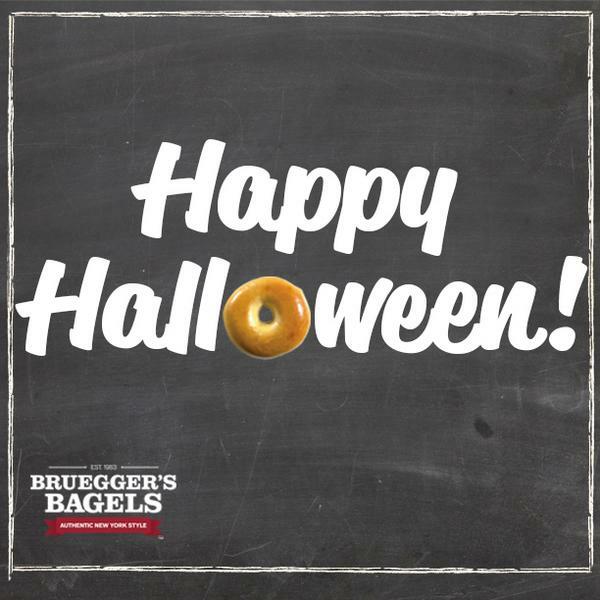 I’ll take a bread-y bagel over candy ANY Halloween. I would not trade…a lower-key Halloween evening. 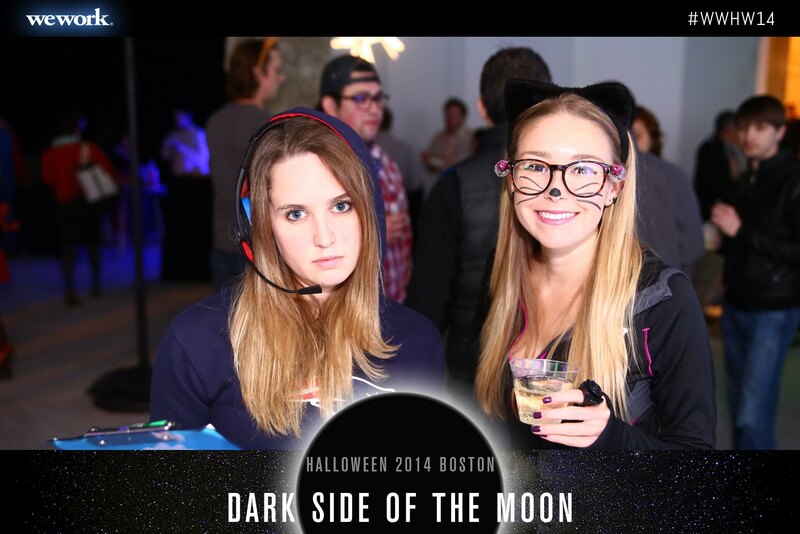 I still really wanted to do something on my first Halloween in Boston…and I also knew some hair of the dog would help me feel better. PLUS I really really wanted an excuse to wear my new black over-the-knee socks, and I don’t have the balls to wear them with a normal outfit. Luckily my friend Allie was at the WeWork party and cigar bar the night before too and was also in the mood for a lower-key night, so she agreed to go with me to some of my favorite Fenway “classy” bars. Perfect! We started at Citizen for drinks and snacks, and then moved on to The Hawthorne for more of both of those things. My favorite way to go out! This Toronto made by one of my favorite Boston bartenders, Sean, really hit the spot. A Toronto is a Manhattan but made with Fernet instead of vermouth. I really needed that slap-in-the-face from the Fernet! I would trade…how much I enjoy going out. In the “old days” I’d hide inside the day after a night out. I’d stay in by myself (or with my parents when I was living at home) and I’d try to “‘make amends” for “what I’d done” the night before. Now if the night after a big night out happens to be a Friday or Saturday, I still want to go out. I look at Friday and Saturday as my chance to go out and enjoy Boston and stay up late without having to worry about setting an alarm. It’s my chance to take in the city and the fabulous restaurants and events it has to offer! My desire to do just that now overpowers my desires to stay in and rest or, very often, punish myself. So yeah, this is a good thing in terms of my recovery. But I also lately find myself missing the days when a Friday night on my couch was satisfying to me. I would not trade…Dad visiting me! It’s that time of year again…the time when Mom spends her time at the Florida condo. So Dad picked out this past Saturday so he could come visit me and we could go to the Tennessee alumni bar to watch the Vols play some football! But first, he took me grocery shopping and I stocked up on all the sauces, condiments, and soups I never buy myself. Because that’s what you do when Dad comes to town. And then I showed him Citizen, because of course one night in the weekend there was not enough for me. He was very impressed! Thanks for the pic Laura! I was worried the Vols would throw yet ANOTHER win our way, but then they ended coming back at the very last moment to win it all. 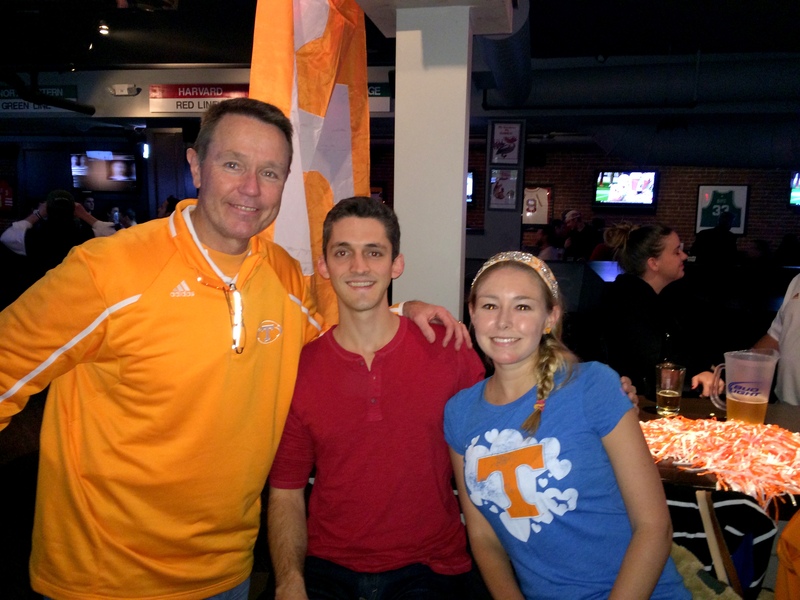 I am SO SO HAPPY that my Dad came to visit to watch a game at the alumni bar that ended so wonderfully! Just look at that happy Dad! Signing in with the alumni association! We also had some visitors stop in like my coworker Allison and her hubby Matt, plus fellow Vol (but dressed as a Gamecock fan???) Greg! After the game ended Dad and I took an Uber to Bar Louie, which thankfully serves their FULL MENU til 2AM (GOOD TO KNOW). I had been doing plenty of imbibing but all I’d eaten all day were a few small salads so I helped myself to a bacon egg and cheese sandwich with tater tots. No photo because I ate it too quickly for that. Man it hit the spot. I would trade…how awful I felt about my body Saturday and Sunday. Saturday all day wearing that shirt, and my “skinny jeans”, I felt so gross. I really wanted to wear boyfriend jeans but due to the awful weather I needed to wear jeans I could tuck into boots. I should have just worn leggings. I deleted almost half the photos I took on Saturday, spent much of the evening hiking up my pants so that they’d cover my love handles, and did a lot of body checking. One of the few photos I was semi-OK with. Sunday I was certainly glad to have yoga pants in my arsenal but sometimes wearing those kinds of clothing items, and feeling better in them, makes me miss the days when I could wear any pair of pants and they always felt loose on me. I’ve been finding myself missing a lot about my old life lately, but I have to remind myself of all I missed out on and how miserable I was. I wasn’t happier back then. I would and wouldn’t trade…the weekend’s workouts. Saturday and Sunday’s workouts both didn’t feel long enough because they involved 30 minutes of cardio each, plus my most recently assigned PT exercises. It just didn’t feel like enough but at the same time I was so OVER being at the gym both days, once I got my cardio done. Each time I went the cardio lifted my mood and made me feel better, enough to be OK with leaving the gym and moving on with my day. So that’s a good thing, but then I missed my normal 60-minute Monday spin class last night because the bikes were full, so now I’m regretting short weekend workouts even more. I did what I could though – I even stayed at the gym last night to do my own 30 minutes of spin on a solo bike outside the spin room. I would not trade…watching football in the Green Monster OF SOMEONE’S LIVING ROOM. So Sunday after my dad left and my workout was done, I got coffee and food prepped and did laundry and cleaned. Being productive made me feel good but I wanted to get out of the house too. Thankfully Jeannie and her boyfriend were headed to a neighbor’s house to watch the Pats play my man Peyton and the Broncos, so I was able to join them, only to find THE COOLEST LIVING ROOM EVER. SERIOUSLY. It even had fake beer taps and buttons that produced sound effects! I would trade…going into the football gathering planning to have one beer and eat no food. You know that “healthy living” phrase “fail to plan, plan to fail”? Sometimes I think that for me, not failing to plan is planning to fail. I didn’t eat much on Sunday (intentionally, I will admit it) and had meal prepped prior to heading out for football. I told myself I’d watch the game, nurse one beer the whole time, and come home and eat a healthy dinner. This turned into three beers, three slices of pizza, and three wings. That would be the reason why I walked home and did not let myself take an Uber. I’m glad I walked home because once again my head was cleared and I got nice and cozy in bed after, and went to bed by 8:30PM. But I just know I wouldn’t have felt so damn guilty about the beer and pizza if I’d gone into the party like a normal person would saying, “Hi friends! What’s up? Let’s have a beer. Oh wow it’s been an hour, I’ll have another one. Oh, you guys ordered pizza? Sure I’ll have some.” Then it wouldn’t have seemed like a big deal. Because I made an unrealistic plan, and failed to follow through with it, I felt all the more guilty. I would not trade…Sunday night’s Homeland. Um, holy freaking crap?! I have more to say about yesterday and this coming week, but far too much work to do. So I’ll leave it at this and hopefully will have time to post again this week. I also have two giveaways coming up for you guys soon that I think you’ll enjoy! What would you trade about your Halloween weekend? Wouldn’t trade? Do you ever find that not failing to plan can lead to planning to fail?